Arrow Trucks & Parts Co.
Arrow Trucks & Parts Company (arrowdetroit.com), offers parts and service for vehicles from heavy duty to light duty. We specialize in transmission, clutch, axle differential, driveshaft, brake, and suspension. 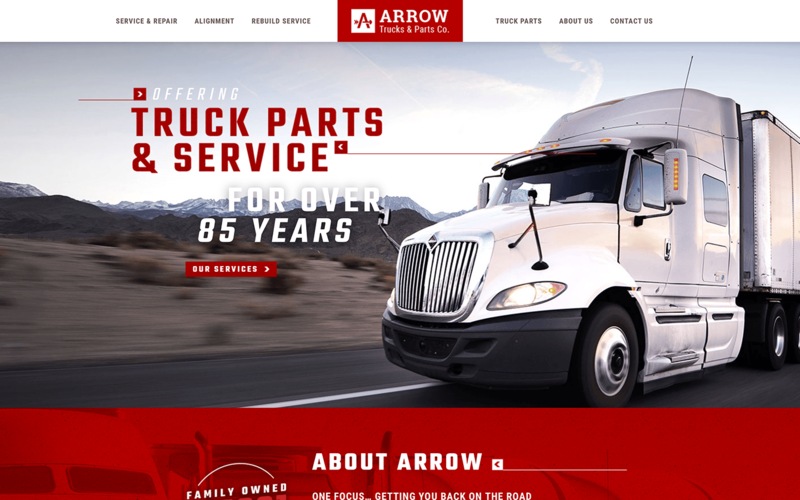 Like many of our new clients, Arrow Trucks & Parts Company’s previous website was very outdated and in need of a change. We worked with their team to create a design that fit their company’s values and update their brand. We created a design that was clear, concise, and achieved the look and feel we were trying to achieve that set Arrow Trucks & Parts head and shoulders above the competition. The internal pages are laid out in a way to give the user all of the information they’re looking for right on the page along with an access to their online parts catalog and contact information. We design and develop with a mobile first approach using a solid foundation of SEO (Search Engine Optimization) practices. We pride ourselves on creating sites that utilize the latest in design trends while at the same time keeping tested and true traditional principles. 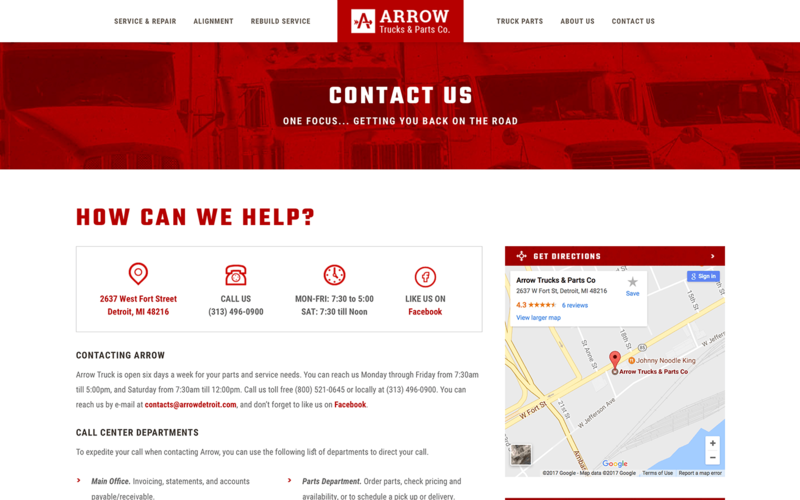 We also design with the UX (user experience) in mind, with the purpose of keeping visitors on your site longer and ultimately driving them to a purchase decision, or in this case, to validate Arrow Trucks & Parts Company as their go-to commercial truck repair shop. 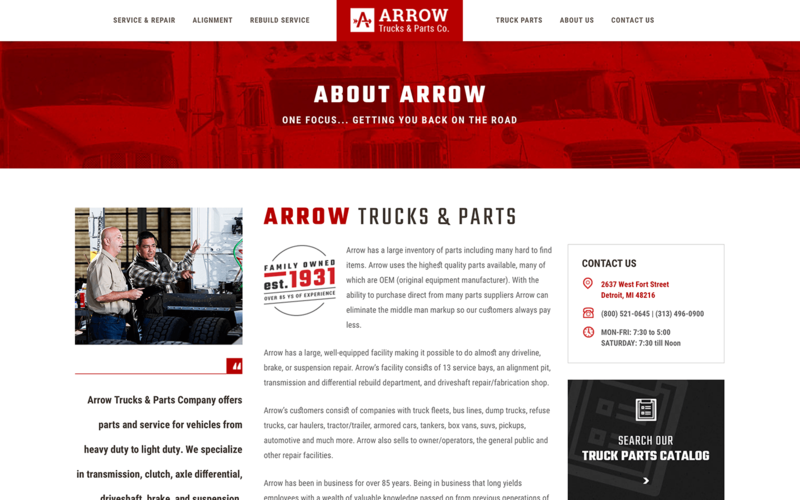 Arrow Trucks & Parts Company (arrowdetroit.com), offers parts and service for vehicles from heavy duty to light duty. They specialize in transmission, clutch, axle differential, driveshaft, brake and, suspension.